The Littlefolks Gospel Productions, Inc.
Sign up for our email newsletter! Or read the latest one online! 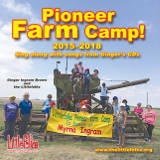 Download the Littlefolks Pioneer Camp registration form. Send the filled out form, with the registration fee, to us by May 15, 2019. A Purpose for Victoria, based on the life of a disabled farm kitty, is a charming book that will tug at your heart. 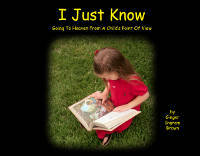 I Just Know tells about going to Heaven from a child’s point of view. Now available, a read-along CD! Littlefolks Gospel Pro­duc­tions, Inc. is a ministry committed to helping kids. One of our greatest goals is to help them learn Bible scriptures. Our ma­te­ri­als also help children deal with challenges, including grief, friend­ship, and learning re­spon­si­bility. 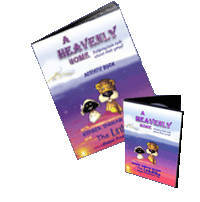 With puppets and music we produce live presentations, CDs, DVDs and books. 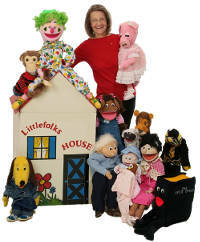 Presentations and materials are primarily written by Ventriloquist Ginger Ingram Brown, founder of Littlefolks Gospel Productions, Inc.
Ginger has been featured on many TV programs and traveled nationwide, as well as internationally. Her Western Kansas farm heritage, public school teaching experience, and faith in Christ are her foundational pillars. Incorporated as a 501(c)(3) organization in 1986, all donations are used to finance Littlefolks productions and travel activities. All board members are professional people of different church affiliations. The 2019 Littlefolks Pioneer Camp will be June 13, 14, and 15. Registration forms and fees are due May 15, 2019. You may download a registration form or contact us for one. The children will stay in tents, make crafts, learn how the pioneers lived, and have FUN! See the Littlefolks Farm page for more information. We had a wonderful time last year and are looking forward to this year’s camp. Don’t miss out! ©2003 - 2019 Littlefolks Gospel Productions, Inc. All rights reserved.